Do you wish you had a bigger bathroom? If so, you’re not alone. In fact, in a recent survey conducted by Moen, almost half the respondents wished they could make their bathroom larger. But, a complete bathroom overhaul isn’t in the cards for most homeowners. And when your bath is too small, it can quickly go from being a retreat from the outside world to a stress-inducing, cluttered place. Whether you’re hoping to update the guest bath or the master suite, you can create a larger-looking bath without actually expanding your space. With a thorough cleaning and some space-expanding illusions, you’ll be relaxed and rejuvenated in your new bigger bath in no time. Using an intense color palette is not always the best technique when it comes to a tiny bathroom. Bold, dark colors can weigh a room down, making it look even smaller. Instead, use pale and cool colors, like soft whites, pastels and neutral tones to add size and depth. Continue the color scheme to the woodwork, trim, vanity and door to create a disappearing look that will lengthen the walls. By eliminating the hard edges created by drastic changes in color, your eye will flow smoothly across the room. It’s important to look at the small details, like faucets and accessories, to create a statement. Choosing a sophisticated design, such as the Moen Weymouth faucet in Chrome, LifeShine Brushed Nickel, Oil Rubbed Bronze or the new LifeShine Polished Nickel finish, can provide a beautiful focal point in your bath. Available in single-handle, widespread and wall-mount styles, faucets in the Weymouth collection feature traditional detailing, like porcelain inlays and a generously sized spout. The unique collection additionally offers matching faucets for the shower or tub, and a complete selection of accessories to provide the perfect eye-catching detail. A mirror in the bathroom can do more than just show your reflection – it can stretch the space by reproducing it. Additionally, mirrors reflect both natural and artificial light, making a smaller room look bigger and brighter by bouncing illumination throughout. Don’t think that mirrors need to only be above the sink. A great trick for improving your room’s reflective qualities is to hang a large, horizontal mirror along the longest wall of the bath. However, if a large mirror is out of your budget, or not practical for your space, the same effect can be created by grouping an arrangement of smaller mirrors. Unique mirrors can often be found at flea markets in different shapes and sizes. Simply paint each frame in complementary colors and group them along the longest wall. This allows for the room to stretch, while also providing a design element that’s uniquely yours. Another easy, dramatic way to use mirrors is to turn the fronts of vanity cabinets into your canvas. Use glue to attach large, square mirrors, or tiny mirror tiles – either square or round – to the outside of cabinets and drawers. For a never-ending room, position two mirrors on opposite walls to create the perfect illusion. Whatever technique you choose, mirrors are great decor pieces that won’t muddle a small bath. Traditional, large vanities with cabinet drawers can make an already petite-looking bath appear even smaller. In order to avoid this common misstep, there are two paths to follow: either install a vanity with open storage areas; or try suspending shelving for a contemporary feel. This will create a more spacious look – without losing precious storage – by giving the shelving a light and airy appearance. Open shelving is perfect for towels and linens, plus items like tissues and cotton balls, which can be stored in decorative jars or containers. Avoid a cluttered look by placing large wicker baskets on the bottom shelf of the vanity for large everyday items, such as brushes, toiletries and makeup. You can create a beautiful bath – regardless of the square footage – that will become a place of relaxation and worthy of attention. Use these tips to turn a compressed and uncomfortable space to one that feels spacious and soothing – without a major remodel. For more information about Moen products, visit www.moen.com. (BPT) – Winter lingered far too long this year. It was cold, it was blustery, and many of us were left wondering if it would ever end. Now summer is here – and it’s time to get outdoors. Instead of being forced to labor through the same old spring chores, use this abbreviated spring as an excuse to stay outside. Fire up the grill, dust off the patio furniture and envision relaxing on a cool night around an outdoor fireplace. Think of an outdoor fireplace as the functional focal point of your backyard or patio. It can anchor your landscaping, accent your decor, and extend your outdoor entertaining season. It can also be a missing link to your ultimate outdoor living room. In fact, outdoor spaces are the No. 1 desired amenity by homebuyers, according to a National Association of Homebuilders (NAHB) study. Second on that list is a fireplace. And according to the Marshall & Swift Residential Cost Handbook, outdoor gas fireplaces can add $3,500 on average to home values. For many of us, big, blazing bonfires just aren’t practical. And they’re not safe or permitted in many residential areas. Modern outdoor gas fireplaces can provide that rustic outdoor ambiance, with the safety and convenience suitable for today’s homes. The Heat & Glo Carolina is a great place to start. It comes in two sizes and has enough heat output to warm a quaint porch, or a large backyard patio. The Carolina is unique for having FireBrick technology: a patented material which is molded into detailed brick styles and increases heat output by as much as 25 percent. It works similar to cast iron, capturing radiant heat and spreading that heat outward, warming friends and family around the fire. Flip a switch on the wall, or press one button on its remote and this fireplace is ready for company. For those looking to add some flare to the backyard, the Twilight Modern does just that. This see-through, indoor/outdoor fireplace installs directly into an exterior wall and creates a two-for-one fireside experience. When the unit isn’t running, it acts as a hurricane-rated window. Turn it on, and crisp flames rise through colored glass. The result is an artistic appearance with solid heat output – perfect for relaxing inside or socializing outside. The Twilight Modern is completely sealed and uses Direct Vent technology, expelling 100 percent of exhaust outside of the home. No venting or chimney is required. This summer season, make the most of your backyard or patio. Extend your living into the outdoors and increase your home value. An outdoor gas fireplace creates another way to enjoy the great outdoors, and another way to accent your home. Visit www.fireplaces.com to search and compare outdoor fireplaces and connect with your local dealer. (BPT) – Parents know kids can’t concentrate when they’re hungry. But did you know that what children eat – especially in school lunches – can also affect their ability to focus, learn and behave well in the classroom? Packing your children’s school lunches is a great way to manage their nutritional intake and help feed their ability to learn. * Brain-building foods: Research supports the ability of certain foods to enhance cognitive function. Foods like fish and nuts, which contain brain-building omega-3 fatty acids, can support focus. So tuna fish salad not only supplies protein, but is also brain food. Not every child is a fan of fish, so look for other kid-friendly options like a handful of nuts. From pistachios and almonds to walnuts and peanuts, a serving of nuts not only contains healthful fats, but also a healthy dose of fiber and vitamin E.
* Fill-them-up foods: “Empty calories” are empty for several reasons, including how quickly they can leave children feeling hungry again after they’ve dined on nutritionally poor calories. Foods that are high in protein and fiber, such as a sandwich of deli meats on whole grain bread, can help kids feel full longer and provide them with nutrient-rich calories. * Liquid power: Sugary sodas are notorious sources of empty calories. One can of regular soda, sweetened with sugar or high-fructose corn syrup, packs about 150 calories, adding up to the equivalent of 10 teaspoons of table sugar, according to the Harvard School of Public Health. Consider packing lunches with more nutritionally valuable beverages like skim milk or water. Skim milk is low in calories and contains calcium and potassium. Water, of course, contains no calories at all and is the best source of hydration. * The choice is yours: Making sure kids get the nutrition they need while providing the great taste they love can be a challenge. A classic sandwich can achieve both if you choose ingredients wisely. Hormel(R) Natural Choice(R) pre-packaged deli meats provide kids with familiar favorites, such as Honey Deli Ham, Oven Roasted Deli Turkey, Roast Beef and Rotisserie Style Chicken Breast, that are 100 percent natural and free of preservatives and additives. Low in fat and free of trans fats, Hormel Natural Choice meats have no MSG, gluten or artificial ingredients. When paired with other nutritious options like whole grain breads, and a side of fresh fruit with non-fat yogurt as a dip, a sandwich of Hormel Natural Choice deli meats can be the foundation of a nutritious lunch. You’ll be amazed how simple making a better choice can be. * Kid-friendly presentation: How you present lunch can encourage kids to eat it. When it comes to packed lunches, a great presentation could be as simple as having one or two favorite lunchboxes on hand and allowing your child to choose which one he would like to carry today. Or, it could be as inspired as creatively arranging a sandwich and sliced veggies to mimic a smiling face when he opens his lunchbox at school. Remember, kids love color, so providing a colorful mix of foods can be very appealing to them. It also gives you the opportunity to incorporate the concept of a rainbow of nutrition, and the value of eating foods from all colors in the spectrum. With the right recipe of creativity, fun and nutritious foods, parents can be confident they’re packing school lunches that will keep kids full and happy throughout the school year. (BPT) – The American family continues to evolve, with multiple generations living under the same roof in more households than any time since the Great Depression. Of America’s 76 million households, 5.6 percent (4.3 million) were multi-generational, according to the U.S. Census Bureau. Homeowners are finding it’s more important than ever to ensure every home improvement project delivers benefits for every member of the family – children, parents and grandparents. For example, according to EnergyStar.gov, replacing a central air conditioning unit that is 12 years old (or older) with an Energy Star-qualified one could reduce cooling costs by 30 percent, and switching to a solar water heater could cut your water heating bill in half. What’s more certain energy-efficient home improvements may qualify you for a federal tax credit. If you install a residential solar water heating system, you could qualify for federal as well as state tax credits and other incentives. You can find a calculator to help tally the potential payback on a solar water heating system and a federal tax credit estimator to calculate your savings on new or replacement solar powered skylights at www.veluxusa.com. Small Cutbacks = GREAT SAVINGS! This info-graphic was originally from Quicken Intuit! To see a larger version, select on the picture below! Great information on how doing small things like changing light bulbs and having potluck dinners can save you big bucks in the end! iOS 7 — House Style! With all of this talk about the new iOS 7 upgrade for the iPhone, we began thinking, ‘what if your house had periodic upgrades where you didn’t have to do a single thing but push a button and then 15 minutes later (or an hour later if your upgrade froze) you would have the latest technology?’ This would be amazing!! 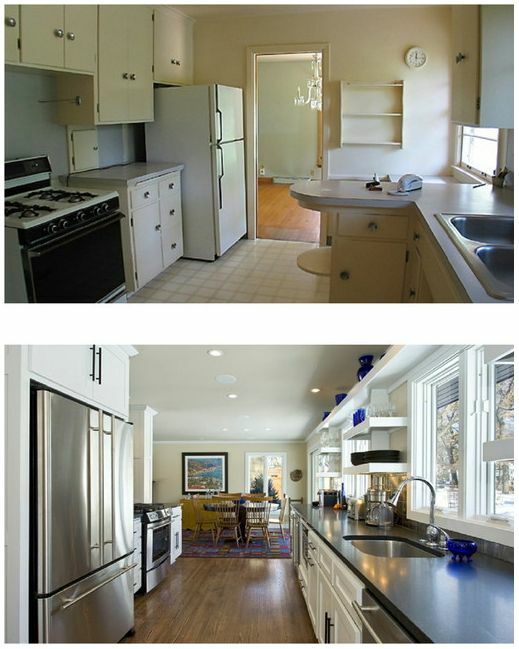 All it took was a little paint on the cabinets! The wall paint is even still the same, but what a huge change! Now this one took a little demo work, but holy cow! What a change!! 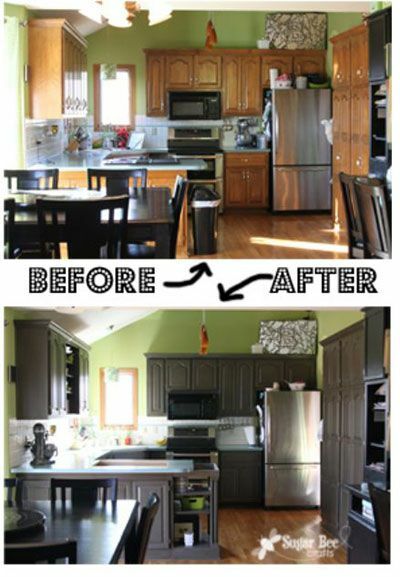 This updated kitchen definitely adds value to this house! Curb appeal doesn’t just attract new buyers, but it also makes your neighbors happy! Just a few plants can create the oasis you always wanted! Bathrooms bring in money to a house! 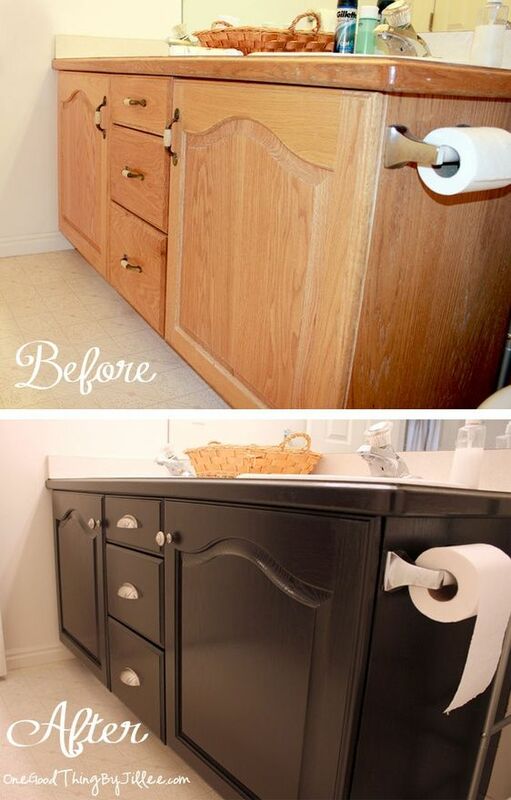 Having updated fixtures and a nice finish on the cabinets can really transform the look and feel of a dated bathroom! 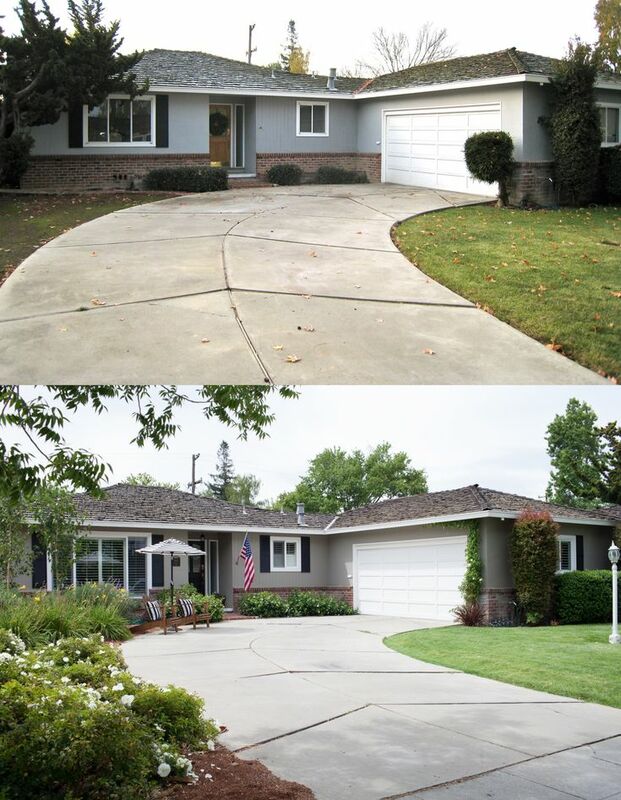 To see more great before update and after update pictures, follow us on Pinterest! Giving is the best form of communication. Today, this video has been posted on our Facebook, Twitter, and now WordPress. When I began watching this video, the first thing I noticed was the poverty-stricken community that it was set in. I then assumed that this video’s premise was to evoke enough emotion out of me and the other viewers to donate something like a dollar a day to the less fortunate, and because, as I’ve said many times, I am a huge emotion-loving sap, I intensely kept watching. I watched as the middle-aged female shop owner scolded the little boy who stole from her and I kept watching as the middle-aged man came over to see what was going on. At first I wasn’t sure what the little boy had taken from the woman until the older man had asked if the little boys mom was sick. I sat in pain as I watched the ashamed little boy stand with his head down awaiting his punishment because I knew that the little boy just wanted his mom to be better, and possibly was even told by his mother to steal the medicine. When the older male shop owner not only bought the medicine but made the little boy soup to take home to his mom, my heart was filled with warmth again. The little boy was in shock by the mans generosity despite his prior thieving actions. The male shop owner knew he would not be re-payed by the little boy or his mom but gave without question and expectation. As the video continued and thirty years had past, you were able to see the unfaltering character of the now even older shop owner who had helped the little boy. He was constantly giving and continuously loving. He gave without expecting or thinking twice, even when his daughter gave him looks of confusion and even annoyance. The story took a turn when the shop owner fell and hit his head, sending him into the hospital with a major brain injury. If this wasn’t heartbreaking enough, it caused his daughter to be left with taking care of him, his shop, and all of his increasing medical expenses. Putting myself in the daughters shoes, knowing how difficult it is to experience a loved one sick/hurt/dying, I also sat in pain as I watched her cry at her fathers hospital bedside. It was then the daughter noticed an envelope on the bed. She opened it and it said that all of her fathers medical expenses had been taken care of 30 years ago with a bowl of soup and medicine that he had given to a little boy in the streets. The letter stating her father had no medical expenses was signed by the doctor; it was the doctor who the shop owner helped 30 years ago. This shot chills down my spine and made me realize the power of giving– not just because of how the now grown little boy re-payed the older shop owner, but because without the help of the shop owner thirty years ago, the little boy might not have even been able to become a doctor. It is the smallest acts of kindness that can really change someones life. This video truly shows how “giving is the best form of communication” because even though this video was set in an entirely different culture from mine, with a language other than English, I was still able to receive such a strong message from it, and you know what is even more incredible?… At the end of the video, I wasn’t even asked to donate a dollar a day to children in need… but I have this overwhelming feeling inside me that very much wants to. This is how you know the message was received. — Give without expectation. Now, obviously I am not telling everyone to run out and donate all of your money to various shelters and charities, but I am just wanting to remind you that the next time you are in a situation where you have the opportunity to give, I hope you remember that giving is the best form of communication. It just could change someones life… even your own. StopDisaster – This iPhone app walks you through preparedness checklists for hurricanes, earthquakes, blizzards and other disasters. Dropbox – Install the program on your PC or Mac, upload files to your folder, and they are instantly available on all your other computers. MotionX GPS Drive – MotionX GPS Drive is the cheapest and most popular way to guide you out of town on an unfamiliar route. Flashlight by Rik for iPhone and Brightest Flashlight – These apps turn your phones into flashlights. Hurricane Tracker – This hurricane-tracking app is for serious weather junkies and people who want to be better-informed. Life360 – The family GPS tracking system can help you find your loved ones anywhere. 5-0 Radio Police Scanner Lite – Pick up police band radio. USAA – Report or view the status of an auto or property claim, submit photos, schedule an appraisal through one of USAA’s approved repair shops, or reserve a rental vehicle. GasBuddy – Uses your GPS to display up-to-the-minute gas prices near you, so you can avoid price gouging. Hands-Only CPR – App walks you through the two-step checklist: call 911, start chest compressions. Take a look at the Friday Update!